American Paintball Park is just one of many clients who have improved the user experience of their site with a new site overhaul. American Paintball Park in Livermore, CA is devoted to providing customers with safe and competitive paintball fun. Our team here at JTech recently had the pleasure of giving their website a much-needed facelift. This overhaul updates the content and design and improves the user experience and in particular, provided the opportunity to make improvements to their online reservation system. In the previous design of the booking system for American Paintball, time slots were represented as unlabeled “boxes,” with the times listed further down on the page, detached from the booking calendar. 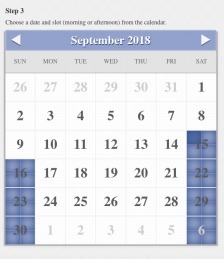 We improved this experience by clearly listing the reservation times inside the calendar itself so that customers can select their desired time with no confusion. The time slots shown change according to which reservation package is selected, and a summary of what you are booking is displayed at the bottom of the page throughout the process. The site is now accessible on any type of device regardless of screen size, so customers can book a party on their tablet or phone as well as their computer. 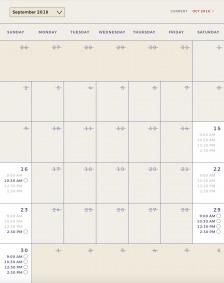 Accordingly, the calendar and reservation form is designed to cleanly collapse to fit within the screen. These vital transactions are no longer hindered by old technology and are now easily accessible and navigable by everyone. Check out American Paintball Park’s new site today! If you suspect your aging website is an obstacle to your business goals, you would benefit from a user experience evaluation or a complete overhaul. Give our experts a call! We’d be happy to help you locate your customer “sticking points” and ways to improve your bottom line, just as we did for American Paintball Park.